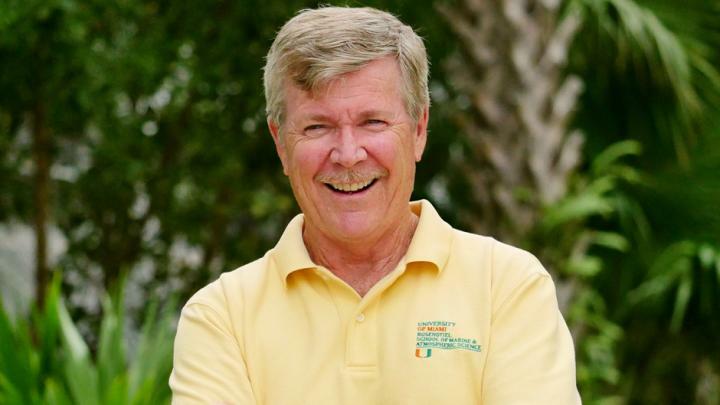 MIAMI-- University of Miami (UM) Rosenstiel School of Marine and Atmospheric Science Professor Dennis Hansell has been named a Fellow of the American Association for the Advancement of Science (AAAS). Election as a AAAS Fellow is an honor bestowed upon AAAS members by their peers. A member of the Atmospheric and Hydrospheric Sciences Section of AAAS, Hansell was elected an AAAS Fellow for his transformative insights into the biogeochemistry of marine-dissolved organic matter and his leadership and service in assessing global carbon cycling processes. A professor in the Department of Ocean Sciences at the UM Rosenstiel School, Hansell was awarded his Ph.D. from the University of Alaska Fairbanks for studies of the nitrogen cycle in the Bering and Chukchi Seas, where he learned about the incredible biological productivity of those systems, exemplified by concentrated marine mammal and seabird populations. He subsequently developed expertise in the cycling of carbon through organic matter in seawater, spending the past three decades working to understand and quantify the processes involved. He has spent several years at sea, on research expeditions to all of the major ocean basins and continents. Hansell's research findings have been presented in over 100 journal articles, dozens of presentations, and multiple books and was recognized by the American Geophysical Union with the 2014 Sverdrup Lecture. He has served on numerous national and international science committees, including as chair of the United States Carbon Cycle Science Steering Committee and vice-chair of the international Integrated Marine Biogeochemistry and Ecosystem Research (IMBER) project. He presently serves as a member of the Board of Trustees of the Bermuda Institute of Ocean Sciences and as chair-elect of the University-National Oceanographic Laboratory System (UNOLS) Council. The tradition of AAAS Fellows began in 1874. Currently, members can be considered for the rank of Fellow if nominated by the steering groups of the association's 24 sections, or by any three Fellows who are current AAAS members, or by the AAAS chief executive officer. This year, 0.3% of AAAS members were recognized as Fellows. The lifetime honor comes with an expectation that recipients maintain the highest standards of professional ethics and scientific integrity. The American Association for the Advancement of Science (AAAS) is the world's largest general scientific society and publisher of the journal Science as well as Science Translational Medicine, Science Signaling, a digital, open-access journal, Science Advances, Science Immunology, and Science Robotics. AAAS was founded in 1848 and includes nearly 250 affiliated societies and academies of science, serving 10 million individuals. Science has the largest paid circulation of any peer-reviewed general science journal in the world. The non-profit AAAS (http://www.aaas.org) is open to all and fulfills its mission to "advance science and serve society" through initiatives in science policy, international programs, science education, public engagement, and more. For the latest research news, log onto EurekAlert! (http://www.eurekalert.org), the premier science-news Web site, a service of AAAS. See http://www.aaas.org.